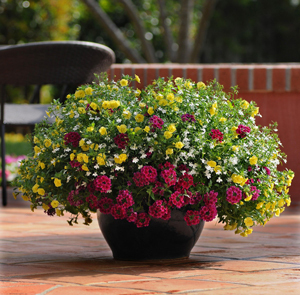 Our Trixi® 'Double Delight' Flower Combination looks, from a distance, like a mixture of red and yellow, miniature roses intermingled with fancy baby’s breath. 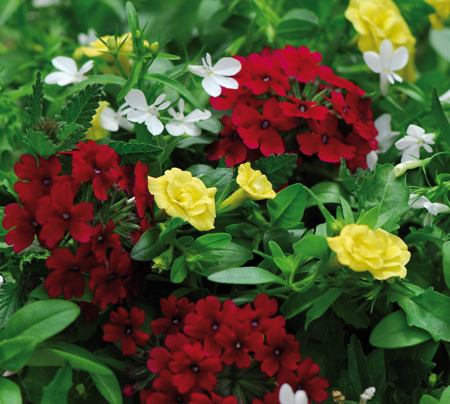 Up close though, the truth is apparent, as you realize the brilliant yellow is MiniFamous™ Double Lemon Calibrachoa and the red none other than Lascar™ Compact Burgundy Verbena. Magadi™ White Lobelia is masquerading as that lacy-looking filler. In actuality, roses would never bloom as prolifically and fill a container so perfectly. Our 'Trixi Double Delight' plants are grown and shipped in fine quality growing medium and are guaranteed to arrive alive and ready to thrive.